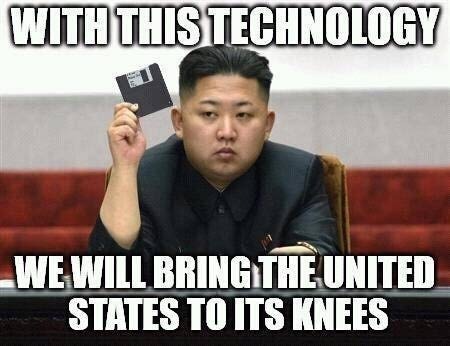 The US Government Must Buy, and Release on the Internet, “The Interview” – How Can People Be So Stupid? As much as I absolutely hate the idea of the bankrupt government spending any money, at all, since it is bankrupt and has no money, we have reached an extremely critical point in history with the total surrender of Sony and the United States government to a short, fat, insane dictator with bad hair in North Korea. The United States has lost every major war it entered, or started, since World War II. We cannot afford to lose the first cyber war, especially since it was launched by a clown like Kim Jong-Un. We have faced many situations where loony people, and loony ideology, like that of the Muslims, has threatened civilization. In particular, I remember two disgraceful events that occurred over the last 10 years. In 2005 we had the atrocious situation where Muslims went, well, Muslim, when a few cartoons of Mohammed were released that the Muslims considered “disrespectful” of “the Prophet” (piss be upon him). Papers and magazines refused to publish the cartoons. Many people could not even understand what the fuss was about: “what cartoons”. I made sure to publish them on my sites, since there is no better weapon against insane ideologies, like Islam, than satire and simply making fun of ludicrous beliefs. But, to make things ever more bizarre, Jytte Klausen wrote a book about the cartoon controversy that finally got published in 2009. It was published by Yale University Press, but they refused to include copies of the cartoons!!! How insane! First of all, how could anyone publish a book about the Mohammad cartoons that caused Muslims to commit insane acts of death, destruction, rioting and mahem, and not include the cartoons which were obviously the very reason for the book? The answer: COWARDICE and POLITICAL CORRECTNESS. Both of these will get civilization destroyed! Now, we have an ugly, insane, fat dictator whose family is responsible for the deaths of millions of people, and the miserable life condition of dozens of millions of other subjects, threatening the United States if Sony publishes a movie that makes fun of his assassination. The simple fact is that there are few people that deserve assassination more than Kim Jong-Un. The idea that we would capitulate to his demands is terrifying and absurd. I understand why Sony caved. They might be legally liable if theatres were blown up by the North Koreans, or their minions, if the movie was shown. But, to not show the movie, for fear of an animal like Kim Jong-Un is inexcusable. We must make the movie available to anyone that wants to see it, including the poor subjects in North Korea. While I am against the government spending money, since it has none, I would fully support the US government buying the rights to this movie for, say, $60 million, and releasing it, for free on the internet. I have heard that Sony spent about $40 million for the movie. So, with this arrangement, they would make $20 million. Not a lot, but more than they will make if it is not shown. At the same time, the North Korean government, and specifically, Kim Jong-Un will be mocked and their threats will be dismissed. This is vital; their threats must not be tolerated or accepted. Of course, if North Korea does anything further in the way of terrorizing or damaging the United States, then we must take further steps. And, we should make it clear that we will not tolerate threats or aggression on the part of North Korea or any other country. But, if we do not make this movie generally available, and spit in the eye of Kim Jong-Un, the future cost will be terrible, both in terms of what North Korea may do to us, as well as what other rogue regimes, like Iran, Russia, China, Pakistan, Afghanistan, and ISIS may do to us in the future. Posted in: Afghanistan, First Amendment, Iran, ISIS, Islam, Kim Jong-Un, Muslim, North Korea, Pakistan.